There’s more to dust control than just walk off mats. A dusty office doesn’t just look unprofessional, it can be a real hazard to your health. In order to help you combat dust in the workplace, Lord Baltimore Uniform Rental offers a full range of dust control products. Here are all the parts you need for a total dust control system to keep your office clean and healthy. Having a mat right at the front door is a great way to stop dirt and dust before it has a chance to really get into your facility and cause problems. Adding your company’s logo to the walk off mats is a great promotional tool since anyone coming or going will see your logo front and center. It’s a great way to make a first impression, and to leave you company’s mark when people are heading out the door. Anti-fatigue mats serve two purposes. First, they are cushioned to help employees who stand in a single place for an extended period of time keep comfortable. Second, they trap dust and keep it from spreading around the room. If stopping dust at the door is good, keeping it from ever coming through the door must be better. Scraper mats remove heavy soil from foot traffic before it can reach your walk off mat. The two mats work in tandem to keep heavy soil out and trapping the lighter stuff at the door. Using a dirty mop head does more harm than good since you’re basically just spreading around dirt that was trapped in the mop. 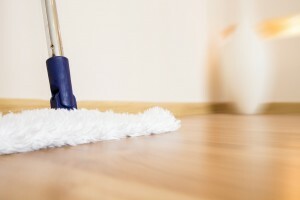 Removing dust and lint is easy with the right dust mop. Lord Baltimore Uniform Rental offers a full line of specialized lint and dust collectors to keep your floors looking their best and your facilities dust free. This entry was posted on Friday, February 17th, 2017	at 11:28 am	. You can follow any responses to this entry through the RSS 2.0	feed. Both comments and pings are currently closed.